Nintendo World” area at Universal Studios Japan is to open in time for the 2020 Tokyo Olympics. The development of animated film based on “Super Mario Bros.” with Illumination is moving along for an anticipated theatrical release around 2022. Are you looking forward to these Nintendo projects? Tell us below. Meh... doesn’t seem too interesting. Would rather they focus on creating great games and innovative technologies. That's cool and I'll definitely visit some day but why do we need a movie? It’s amazing how little of anything has been announced about SNW. I assume it’s to prevent another 2009 for Universal (attendance dropped as everyone was waiting for The Wizarding World that opened in 2010) I’m surprised they even officially announced this ahead of time, currently in Florida they’re building a new Harry Potter coaster and are almost finished and still haven’t officially announced the thing! And it’s opening in just in a couple of months! @VHSGLITCH I doubt the game developers will have any involvement in the construction of a theme park so we should be alright. The 2020 Olympics will be an enormous event with millions of visitors to Tokyo. The theme park will be a major attraction for many of those visitors as well as the locals It can only be a good thing for them in the long run, especially within Japan. Same goes for the movie, if it's good and is a hit at the box office,Mario will be as popular as he's ever been. Also I don’t know how SNW London could even be a thing. Comcast/Universal has no park in Europe and will never touch Europe again after that park they bought in Spain was a huge failure. I’m assuming Mr. Gibson misheard Orlando as London? Sounds like that could be the case @Mrtoad. I've decided to remove this information as there is no official mention of it. I would put money on a Luigi's Mansion Ghost House being one of the attractions. Or how about a virtual reality Starfox simulator with real 360 barrel rolls or a Mute City roller-coaster? @VHSGLITCH Nintendo is not responsible for these attractions, Universal Creative is. And when it comes to innovation, be assured this land will bring tons . Universal announced the coaster last year shortly after tearing down Dueling Dragons. But its true that they haven't announced anything outside that it will be a family coaster. But since Universal is a leaking bucket anyway, we all know what they are building. @VHSGLITCH Vidoe games is a relatively recent development in Nintendo history, even if that's the one that put them on the world map. I can see why they're diversifying, its what keeps Sony so strong. Theme parks in Japan are totally overcrowded every single day, even more so now with the ever increasing number of tourists from China You have to stand in line for hours to get to any attraction. Great news, already saving up. Was thinking of going in 2021 but maybe I'll wait till 2022. USJ is hugely popular among my students. Osaka is a comfortable day trip for them, so going there is always a popular choice on their own time. I join them when the school takes the 3rd year kids (American 9th grade) to Nagashima Spaland (which, despite the name, isn't really about spas) every year. And the 2nd year kids go to Tokyo Disney on their big week long trip. @ritouf Not every single day, not by a long shot. I've taken my students to Nagashima Spaland every year for the last 3 years, never been overcrowded. Why? We go during a school day, on a Wednesday or Thursday. The trick to avoid the crowds is the same as in the US, going on an off season day. Going during school/work hours. Going in late fall or early spring. And they certainly aren't overrun by any particular racial group. @Mrtoad didn’t Universal announce a while back they were going to develop a new theme park in East London? @OorWullie I recall having read a news article about Nintendo granting patents related to rollercoasters and other attractions. All I remember was a DK rollercoaster where the vehicle would be attached to something underneath the track, so that it would look like the vehicle were jumping across tracks, just like in the DKC series. I'll try to look it up. @gaga64 No that was Paramount, and the pulled out of the project. @Gs69 And the manga started in 1982. 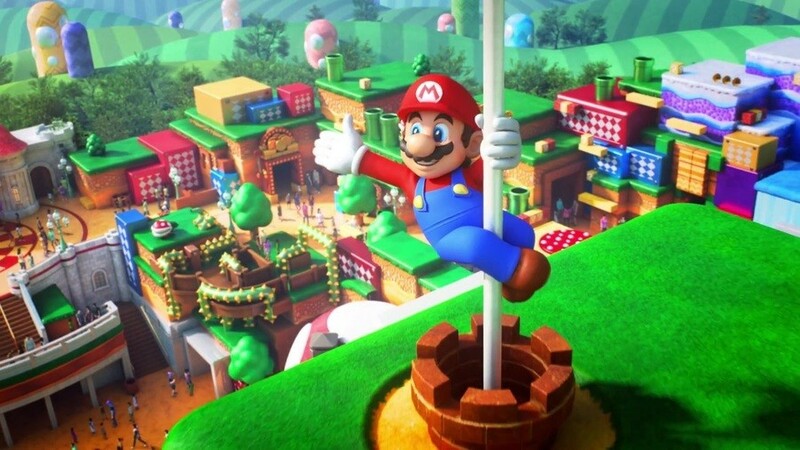 Pole dancing Mario in the promotional material?! Nintendo lawyers insist customers sign a sworn affidavit, waiving their rights to press any injury cases against Nintendo for the duration of the stay at Super Nintendo World. Can't say I'm excited for any of this. Super Nintendo Wotld will be in Japan. Won't be there anytime soon. And Illumination hasn't made a single movie that could be considered anywhere near okay. @Gs69 Let's hope things don't play out the same! If there's going to be a whole theme park based just on Super Mario, I'd hope they put out a Super Mario Bros. simulator. They'd strap you to this harness that attaches to a bungee-like system from above that won't let you hit the ground when you fall. You could have a controller with a big A button on it to jump 5 times your height, and you'd see goomba's down there, and you could jump on them and leap way up in the air again to incredible heights, and always land softly on the ground. The level(s) could be moving forward on a track, and if you miss the jump on the enemy from above, they'd be made out of light-weight spongy foam and upon touch them from the side, would reset, or, push you out of the way and give you a loud failure sound or flashing lights or something. My hubby and I are hoping to have our honeymoon (a year or so after our actual wedding mind you) in Japan. Maybe we should wait for this park to open up after the Olympics and also hit up the new Nintendo Tokyo store that's opening. I already have my eye set on picking up some Japan-only Tamagotchis (rather than importing them) & of course Gundam kits for my hubby! I apparently need to plan for a trip to Universal Florida in a few years. I already wanna see the Harry Potter section. I've been to Universal in California, but that was over a decade ago.